Welcome to “Recovery Rises” The UK’s first magazine, produced with service users, to raise awareness of recovery from addiction. The pain, destruction and loneliness of addiction affect millions of people every day, but millions have also recovered. Our magazine celebrates recovery which is possible for anyone. The magazine covers all areas of addiction and recovery, and anyone can contribute to it. 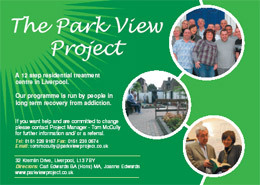 It’s appropriate that “Recovery Rises” is based in Liverpool – the city with the UK’s fastest growing recovery movement.